Turkey hash is one of our favorite leftover dinners following Thanksgiving. It really is pure comfort food–a mix of onion, celery, carrots, turkey, broth, and potatoes. You could even add rice or southern dumplings to this and it would be amazing. Actually, you could add pretty much whatever you want or whatever you happen to have handy. This dish is all kinds of flexible. I like that about it. Usually I make this with thinly sliced red potatoes, but this year I have lots of sweet potatoes on hand, so I decided to change things up a bit. We also have some amazingly delicious, farm fresh eggs from pasture-raised chickens. 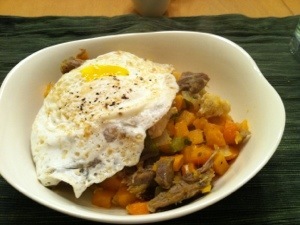 I saw THIS recipe on Sugar Dish Me’s blog and thought–hmmmm, eggs on hash. Yes, that sounded like a great plan! Although Ellie wasn’t sure about the changes to one of her favorite seasonal meals, we all thought this was delicious and different enough that we didn’t feel like we were eating leftovers! Heat the olive oil in a large saute pan over medium or medium high heat. When oil is warm, add onions. Cook for about 4 minutes, until translucent and soft. Add the celery and carrots. Stir well and continue cooking for another 3-4 minutes until vegetables begin to soften. Season to taste with salt and pepper. Add diced sweet potatoes, 1 cup of stock and sage and continue to cook for about 15 minutes. Add more stock if pan begins to dry out. Add turkey and continue cooking for about 20 minutes. The mixture should be very thick, almost like a super thick stew. Check for seasoning and season again if needed. Keep warm. In a smaller saute pan, cook eggs to according to your preference (Ellie likes hers fried, I like mine over easy). Spoon hash into serving bowls, then top each with an egg. 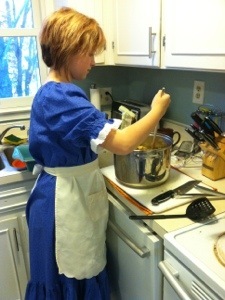 Ellie making stuffing, which we are still enjoying! Our spending for this week is low–$31.54! That includes “paying” ourselves back for stock up vegetables that we froze over the summer! What are we having? Here is our post-Thanksgiving week leftover festival 🙂 Recipes to follow. What is your favorite way to use up holiday leftovers? Turkeys, man. There is a lot of pressure on the turkey at Thanksgiving. Even if you make a million roasted chickens (which does help), you can’t help but be a bit on edge when you are responsible for everyone’s Thanksgiving turkey. Now, I have an awesome family, and they are always great about whatever turkeys I’ve cooked, even when they haven’t been all that great. But still, I like to make something that is worth the 5 hour drive to my house. So this year made me especially nervous. I was cooking a new (old) kind of bird. This year, we ordered a Bourbon Red heritage breed turkey from Homestead Harvest Farm in Wake Forest. Jan raises a limited number of birds with lots of sunshine, grass and love. I’ve heard a lot about heritage breed turkeys and how different they are from the standard grocery store variety, but I’ve never had one, so when I had the opportunity to place an order this summer (yes, this summer!) at the Downtown Raleigh Farmer’s Market, I jumped at the chance. Our bird, Mr. Gibbles as he was named by Ellie, was “processed” Monday, picked up Tuesday and served on Thursday. I’ve never in my life had a turkey so fresh. At 17 pounds, he was quite a good sized bird! Our first observation was that he looked pretty different from the grocery variety. He seemed longer than a grocery turkey and he was not in that strangely uniform, compact shape. Ellie remarked that he really looked like a “real” bird. We got him all ready for his last journey in the oven and served him up to a delighted family. So how was it? Pretty darn fabulous. Very juicy, lots of rich, turkey flavor and great texture to the meat. I don’t think we’ll ever go back again. Cooking Mr. Gibbles was very different from cooking a frozen bird. First, it does not take nearly as long to cook a fresh, heritage breed turkey. Our 17 pound turkey took 2 hours and15 minutes. For reals. And I used a thermometer backup to make sure. Second, heritage breed turkeys have a wonderful layer of thick fat under the skin, so basting is completely unnecessary. He basted himself, which was terrific, although when serving, the fat freaked my dad out a bit. We used the recipe below, which was suggested by Homestead Harvest Farm and it worked beautifully. Being a skeptic, I allowed more time than I really needed, which made for some quick hurrying around when the turkey was done so soon, but it all worked out in the end. Mix the butter and chopped herbs until well combined. Rub the butter mixture over the turkey skin and under the skin if you can. Put the turkey in a large roasting pan. Add broth or wine to the bottom of the pan. Butter a piece of parchment to fit over the turkey. Use the parchment to make a tent over the turkey. Insert a meat thermometer into the breast. Put the bird in the oven and roast until the breast meat is 145 degrees. Do NOT open the oven door during this time. Remove the parchment tent over the turkey and continue cooking until the internal temperature is 155-160. Remove turkey from the oven (the meat temperature will continue to rise after removing it from the oven). Let the turkey rest for about 20 minutes before carving. Carve and serve the turkey with trimmings. Poor potatoes. For years, they were maligned as the source of all dieting evils. Eat a potato and you were sure to get a muffin top and diabetes. Maybe simultaneously. I never really liked potatoes all that much until I tried fresh, organic potatoes from Hill Top Farm. Those little potatoes are like a whole other food group. It made me realize how tasteless most grocery store potatoes are. Now, I have a new appreciation for them, although we don’t eat them a great deal. I think that perhaps part of the potato problem is how we cook potatoes more so than the actual potato itself. Potatoes do have vitamins and minerals that are good for us, so why not? Fried potatoes, potato chips and potatoes slathered in gravy and/or cheese are not health food. If you buy good potatoes, though, you don’t have to do anything much at all for them to be amazing and satisfying. We recently received some purple potatoes with our Produce Box, so I did some potato experimenting. I had never had purple potatoes before, but apparently the rest of the world loves them! These potatoes have flesh that is a deep bluish purple–mine were very dark. Purple potatoes are high in carotenoids, which offer some cancer protection. Carotenoids are not found in white potatoes. Early studies with purple potatoes also show a correlation between the dark potatoes and lower blood pressure. For our cooking experiment, I quartered the first batch and roasted them with some olive oil and kosher salt. YUM! I did notice that like beets, the purple potatoes bleed their color. It’s a little disconcerting to look down and see your bluish hands! Ellie and I decided to make purple mashed potatoes with the second batch. I was worried that the dark color would bleed out into the cooking water, leaving me with gray potatoes, so we boiled the potatoes whole (they were pretty small anyway) and mashed them with their skins on. The result? Cool looking purple mashed potatoes! We served them with a local pork roast and roasted local winter veggies! Scrub potatoes, but do not remove the skins. Put potatoes in a large Dutch oven. Fill the Dutch oven with water to cover the potatoes by about 3″. Heat pot over medium high heat until boiling. Turn heat down if necessary and continue boiling potatoes for about 15 minutes. This will depend on how large your potatoes are, so check the potatoes and cook longer if needed. They should be very soft. Drain the potatoes and reserve 1 cup of the cooking water. Return the potatoes back to the pot and put the pot back on the stove eye that is cooling. Toss the potatoes around until they are fairly dry. Mash the potatoes with a masher. Add the butter and milk and mix together with a wooden spoon (you can also use an immersion blender for this). If the potatoes are too dry, add the reserved cooking liquid. I totally get it now. All that work, all the canning, all the freezing. I get it. Because now when the days are cool and there is nary a green bean, peach or tomato to be found at the farmer’s market, I can make something like this awesome chili with lots of my own, local vegetables. It’s pretty awesome. And it makes all the sweaty afternoons in a steaming kitchen totally worth it. I wondered at the end of the summer if I would ever do all that work again and now I know the answer. Yes. This chili is completely delicious. 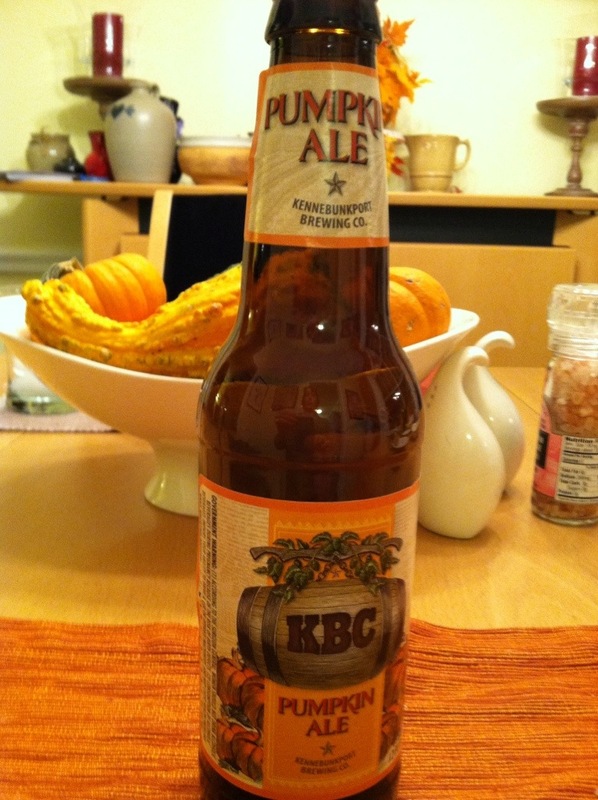 It was posted by The Scrumptious Pumpkin as Drunken Pumpkin Chili. I like the name, but since I made this for a sleepover my daughter had, I thought I’d tone down the beer reference and focus on the local. I did, however, use the pumpkin ale she recommended and it was a great addition 🙂 Typically, I serve pizza for a sleepover, because who in the world doesn’t like pizza? As it turns out, we all liked this chili–so much that our plans for a second dinner are out (but I do have a fabulous lunch packed for work tomorrow!). I changed up the original recipe a bit to suit the local ingredients I had on hand, like fresh oregano, frozen whole tomatoes, frozen roasted red peppers and frozen, roasted jalapenos, but the original recipe is HERE. Check out the otherScrumptious Pumpkin recipes, too. She does a great job using spices and natural flavors to tone down our use of fats and sugars! In a Dutch oven, heat the olive oil over medium high heat. Add the onions and the garlic and saute for about 4 minutes or until onions are translucent. Add the carrots and bell pepper and saute for about 5 minutes more, until carrots begin to soften. Add the ground beef, breaking it up with a spoon, and brown. Stir often. Add the spices and tomatoes and stir well. Add the beer and stir again. Let simmer about 5 minutes. Add the pumpkin puree and peppers. Season to taste. Add the drained beans. Reduce the heat to low and let simmer for about 45 minutes (because I used the frozen tomatoes, my chili had a lot of liquid and needed to simmer a good while to reduce and thicken). Your house will smell truly amazing. Drink the remaining beer. Marvel at your domestic skills. Remember to be thankful for other bloggers who share their recipes. Serve alone or with grated cheese. So we are on the brink of the holiday shopping season and I’m working on a plan. I don’t know that everyone will enjoy my plan, but we’ll try it and see. As I look around to my family members, it is good to see that none of us really “needs” anything. Thankfully, all the adults are employed and all the children have warm clothing, school supplies and whatever electronics they feel they must have (this, however, is a moving target). So with all the obvious suburban “needs” taken care of, what to do about holiday gift giving? I’d like to focus on the local–local products, local businesses and local experiences. This means very limited mall shopping (I’m making an exception for teen clothing) and finding matches between the people I love and the resources I have locally. Can I do it? Will Christmas morning be a big bust? Who knows, but as I find ideas and resources, I’ll share them with you. You do the same! Well, here we are in the big lead up week to Thanksgiving! I can’t wait! I love Thanksgiving–love having my family together, love my house smelling like roasted turkey, love cooking up a storm. I have ordered a local turkey from Homestead Harvest Farm and will pick that up next week. Otherwise, I’m still planning! Until then, though, I have a great week of recipes that will lead us up to the big day! Sadly, this is our last week of Produce Box delivery, so I’ll be back at the farmers markets pretty regularly after this. I like the markets, though, so it’s worth the effort and time it takes to get down there! Since it is our last week, I ordered extra, so our Produce Box bill is a bit larger than usual. Still, our weekly food bill is $92.17–under our projected budget for the week. Mostly, this is because I cooked so much last week that we are still eating leftovers! We are determined not to waste the food we purchase and are committed to getting the refrigerator cleaned out before we pick up the Bird! 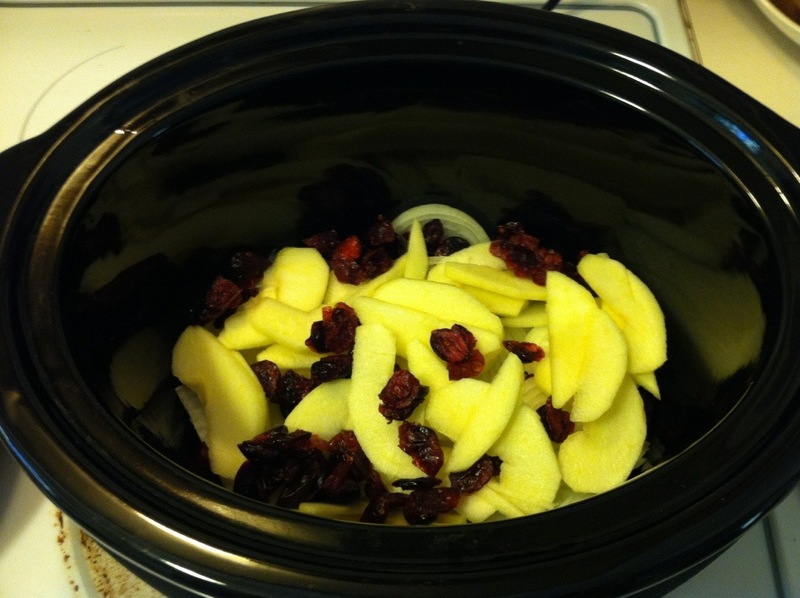 Onions, apples and cranberry make a nice base for this slow cooker roast! Last week my friend Sarah commented on a dish she made involving pork roast and apple cider. Hmmmmm, sounded pretty good to me, so I decided to take a try myself and use the leftovers for our football tailgating lunch. This slow cooker roast takes advantage of our fresh, local apples and apple cider. I also added some dried cranberries, which were tasty. 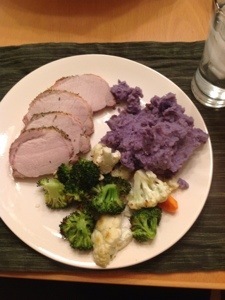 We served it with our delish purple potatoes! Peel onions and slice thin. Put in bowl of a slow cooker. Peel and core apples. Slice thin and add to bowl of the slow cooker. Sprinkle dried cranberries and thyme over onions and apples. In a heavy skillet, heat olive oil on medium high heat. Brown pork on all sides. Place pork roast on top of onion/apple mixture. Pour cider over all, cover and cook on low for 7 hours or on hi for 4. Serve pork sliced or pulled with apples on top! 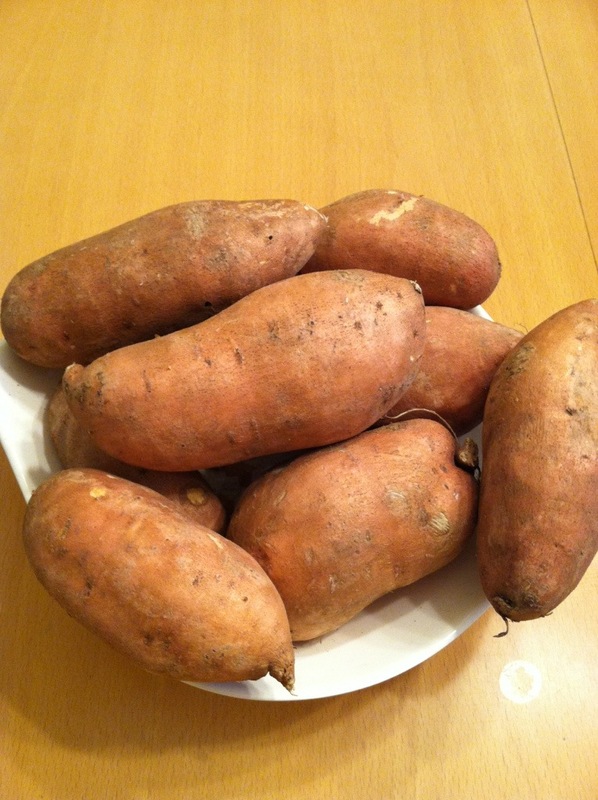 Farm fresh sweet potatoes from our NC farmers! Our Produce Box local veggie delivery service is ending next week (just for the winter), so I ordered a stock up box of sweet potatoes to take me through the holidays. Now I’m realizing this is a LOT of sweet potatoes! Thankfully, I keep finding new and inventive recipes for incorporating more of these healthy sweeties into our diet. This recipe is adapted from a vegan recipe you can find HERE at Ohmyveggies. I’m sure the vegan version is great, but I had chorizo from Mae Farm and I love cheese, so we tossed vegan out the window this time. We also subbed Swiss chard for the kale in the recipe because that is what we have this week. Preheat oven to 400 degrees. Roast sweet potatoes in oven for about 45 minutes or until tender. Remove from oven and let cool slightly (you can do this the night before). Remove potato skins, transfer potato flesh to a small bowl and mash until smooth. While potato is cooking, crumble the chorizo into a large skillet and cook over medium heat until brown. Use the back of a wooden fork to break up any large pieces. Remove from pan and drain on paper towels. Reserve 3 tbsp. of drippings and discard the rest. Heat reserved drippings over medium low heat and add onion. Saute onion until caramelized, about 30 minutes. Stir in Swiss chard and sausage and continue to cook until greens are wilted. Season to taste with salt and pepper. Combine black beans and paprika in a small bowl. Divide sweet potato, sausage mixture and beans evenly onto 1/2 of each tortilla. Sprinkle with cheese. Fold empty half over the filled half. Put quesadillas on a parchment or foil lined baking sheet and brush tops with olive oil. Bake at 400 for 8-10 minutes. Serve with salsa and a green salad! What a fun week we have ahead of us! It’s making for some challenging meal planning, but we are going to enjoy it! Our farmer’s market is chock full of squash, sweet potatoes, kale, collards (which are better after a frost, so we’re leaving them for now), Swiss chard, cabbage, broccoli, cauliflower and carrots. Apples are in supply, but pricier than usual. In preparation for Thanksgiving, I have ordered our heritage breed turkey from Homestead Harvest Farm and have a small, boneless ham from Mae Farm as well. But in the weeks before Thanksgiving, we are still managing to eat well and make the most of our fall crops! Our budget this week is $94.82, but we are eating out one night (Tom’s Birthday!!! ), so that’s one dinner that is not on our menu (and I can guarantee it will cost more than $5.28), so we’re not really ahead food-wise, but we will have fun celebrating. Also, Tom #besthusbandever surprised me with tickets to my first ever NFL football game to see my beloved Broncos play in Charlotte (awwwww!). Since food at the stadium costs a small fortune, we are planning to save money by emptying our fridge tailgating with our pork roast leftovers and some other yummy homemade foods! I figure we are probably saving about $1,000 $50 not buying food at the stadium, so we are technically ahead this week, right? Right? I think this is why I am not an accountant. Regardless of how you count your pennies, have a healthy and happy week! Menu–Here is what we’re having this week! Saturday–Out for Tom’s Birthday Celebration!! !